Just a quick update on the wolves that were released from the Haliburton Wolf Center on New Years Eve. For those just joining in, here is the beginning of that story. As of today, the two loose wolves remain at large, but are staying close to the wolf center. No word on how the youngsters inside the enclosure are doing, but I imagine if there was any news about them, Peter Schleifenbaum would have mentioned it. I’ll just grab a couple of quotes from Peter’s updates and then you can go read his full posts at the links below for more details. Haida and Lonestar have settled in quite comfortably – outside the Wolf Centre. They are in good physical condition and interact with the females left inside the enclosure frequently. They move about and are seen not just daily but hourly. They travel within a pie-shaped area north of the Wolf Centre, sometimes as far as 10 kms away, only to return in the evenings. That is with the exception of the last 2 nights, when they were observed feeding on the remains of a fawn on McDonald Lake, which was killed by a wild pack within Haliburton Forest and only app. 4 kms away from the Wolf Centre. Haida and Lonestar came in 3 nights ago…pulled the beaver down … and nothing happened. … last night the mercury dropped to –39 at Haliburton Forest! Bunjees are like spaghetti al-dente at that temperature. They lose their spring … and were unable to pull the gate shut when the wolves pulled the beaver. We now reconfigured and are using aircraft cable and weights suspended from pulley-blocks. But so far, and this fabulous contraption has now been set up for a week, none of the two wolves has even made tracks close to it. We know that at some point hunger must drive the two outsiders and they sure well know where they found a beaver the last 7 times they looked for it. ..But one explanation may also lie in the last observed sighting of Haida, who was trotting down the road to the local landfill site. Unfortunately that, being last Friday , was also the last confirmed sighting we have had of either Haida or Lonestar. So if anybody in the larger Haliburton-Dorset area sees a black wolf ( which are VERY rare in the wild in Ontario) or even two, a black and a beige one, we’d like to hear about it. Thank you very much for providing this update on the story. When the time comes for more in-depth information, may I contact you? 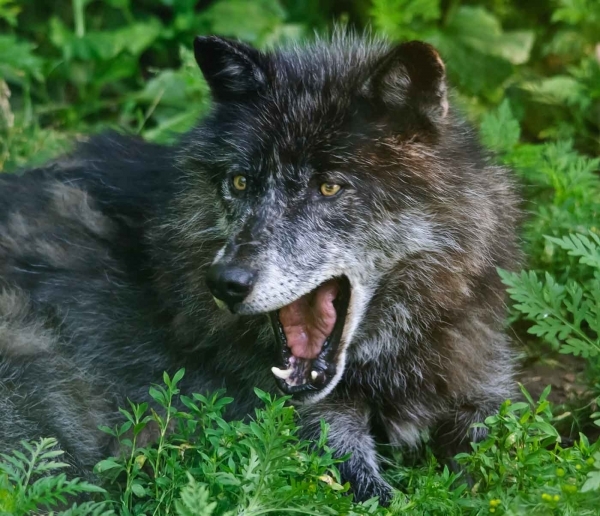 Norm, you are certainly welcome to contact me, but really I don’t have any more information about the wolf situation than that which appears on the Haliburton blog and Facebook page. I’m just repeating it here for my regular readers who may not think to go read the official updates. I have not contacted Peter Schleifenbaum because I think he has enough to worry about and he’s doing a good job of posting regular updates on his sites. That said, I’m happy to have a conversation about this situation and the Haliburton wolves in general. I appreciate your interest.